Ergonomics is the science of human work. One goal is the adaption of work to the human, thus to create better working conditions and to avoid health risks. 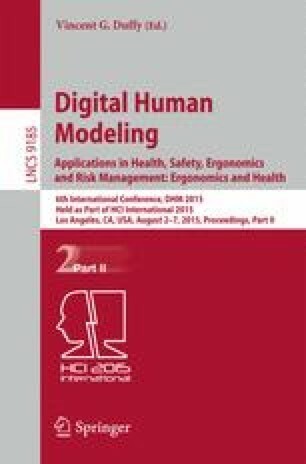 Increasingly often, digital human models and corresponding evaluation methods are used. Due to the mass of data and the variety of possible analyses which come along with a simulation, the interpretation of the outcomes can take a long time. We introduce a new concept, which enables a quick and understandable visualization and navigation of critical ergonomic situations and their causes. There are filter mechanisms available for changing the level of detail. These enable a representation for specific target groups. Prior to the development of the concept, expert interviews were conducted to specify the user requirements. Each iteration step of the design process was evaluated in cooperation with ergonomics experts.